Father John Lanzrath shared a story Thursday, March 28, often told by Monsignor William Carr, that reflects his love of the Cathedral of the Immaculate Conception. When Bill Carr was 17 years old, Fr. Lanzrath said, he walked from Wichita’s East High School to the Cathedral where he began praying. “Sister, I attend East High School and we had a half-day of school today,” he answered. “Why are you attending East High? Why aren’t you at the Cathedral?” she then asked. Fr. Lanzrath delivered the homily at Msgr. Carr’s funeral. A few months later on June 19, 1950, the eve of his 18th birthday, Bill Carr became a Catholic in this Cathedral, Father Lanzrath said. Nine years later, in March of 1959, that Sister’s counsel was fulfilled when Bill Carr has ordained a priest of Jesus Christ. Msgr. Carr, rector of the Cathedral of the Immaculate Conception for seven years, died Sunday, March 24. He was 86 and had been a priest of the Diocese of Wichita for 60 years. Father Lanzrath, pastor of St. John Parish in El Dorado, was the homilist for Msgr. 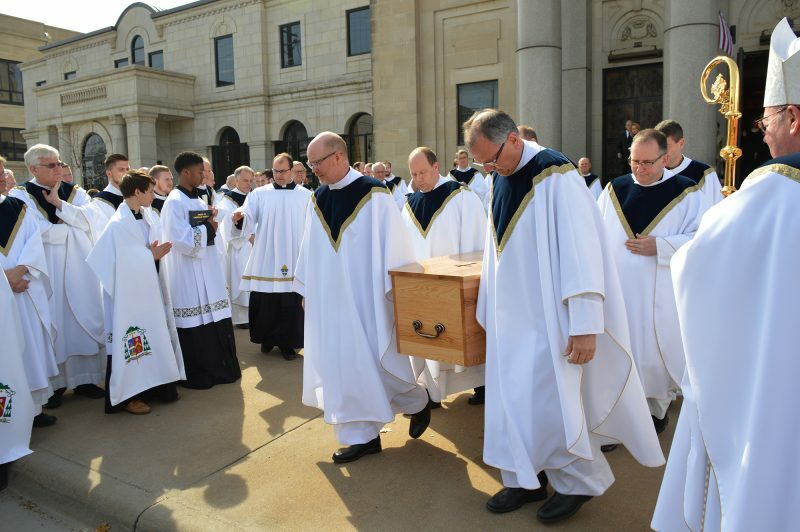 Carr’s funeral at the Cathedral and began his reflection by sharing one of Msgr. Carr’s favorite jokes. There were several religious sects during the time of Jesus – the Scribes, the Essenes, the Herodians, the Pharisees, the Sadducees, he said. With Bishop Carl A. Kemme and nearly all of the priests of the diocese with him in the sanctuary, Fr. Lanzrath said from the ambo that the focus of the Mass of Christian Burial is on Jesus Christ, not Msgr. Carr. Msgr. Carr served at the Cathedral three times, the third was an appointment as rector of the mother church of the diocese. Father Lanzrath expressed his gratitude to members of his family attending the funeral and thanked those at the Catholic Care Center and the Priest Retirement Center who cared for him – especially Father John Hotze for his attention to Msgr. Carr these last few years. A vigil was prayed for Msgr. Carr Wednesday, March 27, at Church of the Resurrection, 4910 N. Woodlawn, Wichita. He was buried at Ascension Cemetery in Wichita. Msgr. Carr was born on June 20, 1932, in Tulsa, Oklahoma. He studied at St. Louis Prep and Kenrick Seminary in St. Louis before his ordination on March 14, 1959, in Wichita. 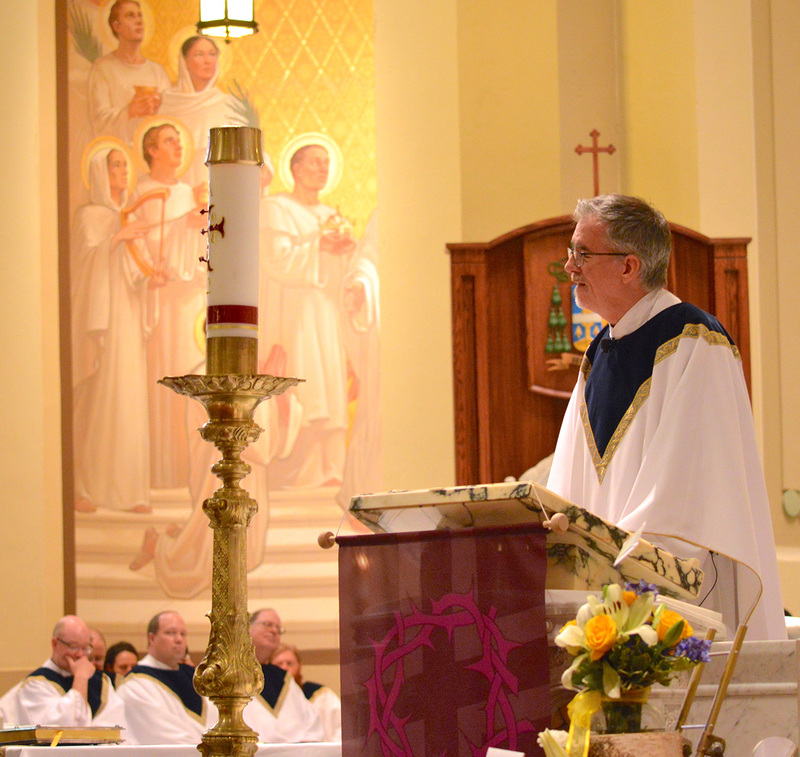 Father Carr’s first and final assignments were to the Cathedral of the Immaculate Conception. He was named an assistant there in 1959 and then named an assistant at St. Teresa Parish in Hutchinson in 1962. He was assigned as a religion teacher at St. Teresa High School in 1963. He returned to the Cathedral in 1964 and served in several diocesan commissions, including an assignment at chairman of Confraternity of Christian Doctrine in 1969 and director of the Department of Religious Education, before an assignment in 1970 as chaplain of Bishop Carroll Catholic High School. He was also named chaplain of Mount St. Mary Convent in 1971. In December of 1971 Father Carr was named pastor of St. Mary Parish in Moline. That was followed by assignments as pastor of St. Patrick, Chanute, 1976; St. Paul Newman Center, Wichita State University, 1980; Our Lady of Lourdes, Pittsburg, 1987; and Church of the Resurrection, Wichita, 1989. He was named rector of the Cathedral in 1995. He retired in 2002 after serving many parishes and on many committees for the diocese. He was preceded in death by his father and mother, and by his sister, Barbara. He is survived by his sisters, Carol J. Comer, Mary Santi, Lucy DeSilvis, Martha Carr Falkenstein; brothers, Thomas J. Carr, John S. Carr, Orlando Carr, and George Carr; and by numerous nieces and nephews. A memorial has been established with: Fr. Kapaun Guild, 424 N. Broadway, Wichita, KS 67202. A brief slideshow of the funeral is below.